Villa with three bedrooms, two bathrooms, three living rooms and garden with pool. This incredible Villa is located in a charming estate on the beautiful island of La Palma with stunning views of the Atlantic Ocean and the Caldera de Taburiente. The farm of about 5,000 square meters is originally a banana plantation and is located in a rural setting with a quiet and isolated location at approximately 420m altitude. 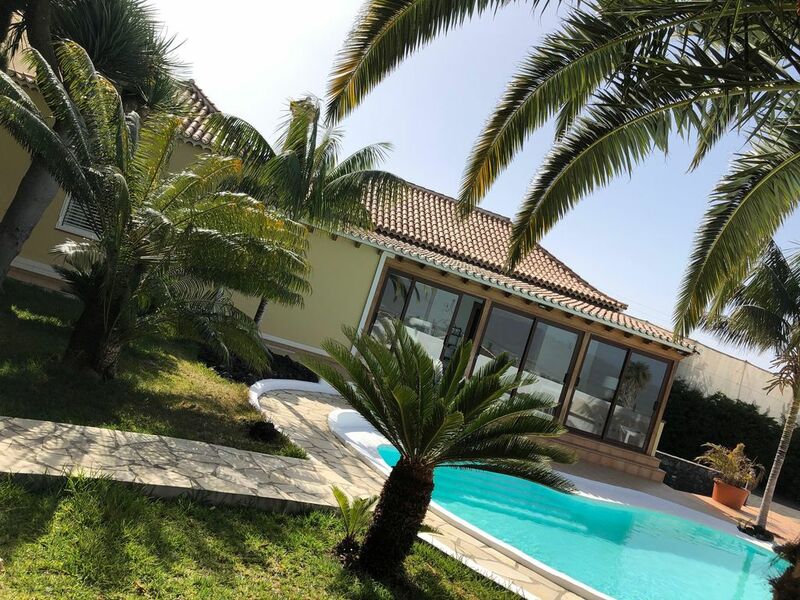 It is a spacious one-storey Villa with a magnificent garden and a beautiful pool with sunbeds and a great barbecue and tables to eat in an incomparable setting overlooking the Atlantic Ocean and La Caldera de Taburiente. Fully equipped kitchen with refrigerator, oven, electric hob, toaster, coffee machine, water heater and refrigerator. Three living rooms with comfortable sofas and modern fireplace, one with panoramic views of the Caldera de Taburiente, flat screen TV. With two bathrooms, one with a whirlpool bath and another with a hydromassage column. Spacious rooms with double bed, spacious closets and chest of drawers, the third bedroom has two single beds with another spacious closet. Villa Tajuya is centrally located on the sunny west side of the island with the stunning backdrop of the Cumbre mountain in the back and the Aridane valley that stretches out in front of us. 5 minutes by car from the center of El Paso and Los Llanos de Aridane, in the idyllic outskirts, in a quiet residential street is our Villa. Villa Tajuya is superb. It was spotlessly clean and stylishly decorated. It is really spacious and we enjoyed using all of the rooms for different times in the day; the main living room in the evening, the middle room for a bit of shade and to read during the day, the dining area in the evening to eat and watch the sun go down. The outside area is wonderful and we spent many happy hours lounging around the pool, and the view of the mountains and sea is spectacular. The villa is in a lovely, peaceful spot and an easy 10-15 minute drive to Puerto Naos, Puerto Tazacorte and Los Llanos. There is a bus stop to access these places just a 5 minute walk away, and a huge supermarket in El Paso a 10 minute drive away. The only drawback we found was that it was difficult to walk anywhere from the villa, as the roads don’t all have pavements. However, we did find an amazing restaurant a 10 minute walk away called ‘Cafe Giardino’, where we enjoyed two wonderful meals, and great service. Communication with Miguel has been great; he responded immediately to any questions I had. La Palma is a lovely, friendly island with some breath-taking scenery. Estupenda para unas vacaciones familiares. La casa es muy bonita, con unas vistas preciosas, espaciosa, cómoda, disfrutamos mucho del jardín. Estaba todo perfecto y la atención fue excelente. Großzügige Raumaufteilung; sehr ruhig gelegen; sympathischer, hilfsbereiter Vermieter; wir (drei Erwachsene) haben uns sehr wohl gefühlt. Ein Stück Paradies auf Erden, Erholung pur, sehr sauber, alles funktioniert top! Schon am Morgen der Blick vom Bett aus auf die Palmenblätter vor dem tiefblauen Himmel löste Ferienstimmung und Glücksgefühl aus. Das Frühstück unter der schönsten Palme von La Palma im grosszügigen Garten mit Pool bleibt für ewig in Erinnerung. Die Fotos des Angebots, die Villa und der Umschwung, geben ein unverfälschtes Bild des Anwesens, das rückseitig von Bananenplantagen umgeben und geschützt ist. Die Aussicht aufs Meer mit abendlichem Sonnenuntergang runden den Tag am perfekten Gartengrill ab. Sogar das Wäsche waschen machte uns hier mehr Spass, da es optimal eingerichtet ist. Der Vermieter ist sehr aufmersam, herzlich, jederzeit per whats upp erreichbar und respektiert die Privatsphäre. Wie waren zu viert hier und waren alle absolut begeistert. Gerne jederzeit wieder! Hasta luego!! !